The objectives of FTP are 1) to promote sharing of files (computer programs and/or data), 2) to encourage indirect or implicit (via programs) use of remote computers, 3) to shield a user from variations in online file storage systems among hosts, and 4) to transfer data reliably and efficiently. FTP, though usable directly by a user at a terminal, is designed mainly for use by programs. The attempt in this specification is to satisfy the diverse needs of users of maxi-hosts, mini-hosts, personal workstations, and TACs, with a simple, and easily implemented protocol design. This paper assumes knowledge of the Transmission Control Protocol (TCP) and the Telnet Protocol. These documents are contained in the ARPA-Internet protocol handbook. In this section, the history, the terminology, and the FTP model are discussed. The terms defined in this section are only those that have special significance in FTP. Some of the terminology is very specific to the FTP model; some readers may wish to turn to the section on the FTP model while reviewing the terminology. FTP has had a long evolution over the years. Appendix III is a chronological compilation of Request for Comments documents relating to FTP. These include the first proposed file transfer mechanisms in 1971 that were developed for implementation on hosts at M.I.T. (RFC 114), plus comments and discussion in RFC 141. RFC 172 provided a user-level oriented protocol for file transfer between host computers (including terminal IMPs). A revision of this as RFC 265, restated FTP for additional review, while RFC 281 suggested further changes. The use of a "Set Data Type" transaction was proposed in RFC 294 in January 1982. RFC 354 obsoleted RFCs 264 and 265. The File Transfer Protocol was now defined as a protocol for file transfer between HOSTs on the ARPANET, with the primary function of FTP defined as transfering files efficiently and reliably among hosts and allowing the convenient use of remote file storage capabilities. RFC 385 further commented on errors, emphasis points, and additions to the protocol, while RFC 414 provided a status report on the working server and user FTPs. RFC 430, issued in 1973, (among other RFCs too numerous to mention) presented further comments on FTP. Finally, an "official" FTP document was published as RFC 454. By July 1973, considerable changes from the last versions of FTP were made, but the general structure remained the same. RFC 542 was published as a new "official" specification to reflect these changes. However, many implementations based on the older specification were not updated. In 1974, RFCs 607 and 614 continued comments on FTP. RFC 624 proposed further design changes and minor modifications. In 1975, RFC 686 entitled, "Leaving Well Enough Alone", discussed the differences between all of the early and later versions of FTP solution. RFC 691 presented a minor revision of RFC 686, regarding the subject of print files. Motivated by the transition from the NCP to the TCP as the underlying protocol, a phoenix was born out of all of the above efforts in RFC 765 as the specification of FTP for use on TCP. This current edition of the FTP specification is intended to correct some minor documentation errors, to improve the explanation of some protocol features, and to add some new optional commands. This specification is compatible with the previous edition. A program implemented in conformance to the previous specification should automatically be in conformance to this specification. ASCII - The ASCII character set is as defined in the ARPA-Internet Protocol Handbook. 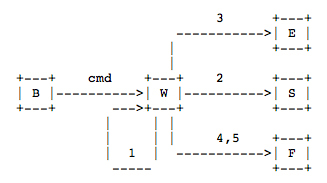 In FTP, ASCII characters are defined to be the lower half of an eight-bit code set (i.e., the most significant bit is zero). access controls - Access controls define users' access privileges to the use of a system, and to the files in that system. Access controls are necessary to prevent unauthorized or accidental use of files. It is the prerogative of a server-FTP process to invoke access controls. byte size - There are two byte sizes of interest in FTP: the logical byte size of the file, and the transfer byte size used for the transmission of the data. The transfer byte size is always 8 bits. The transfer byte size is not necessarily the byte size in which data is to be stored in a system, nor the logical byte size for interpretation of the structure of the data. control connection - The communication path between the USER-PI and SERVER-PI for the exchange of commands and replies. This connection follows the Telnet Protocol. data connection - A full duplex connection over which data is transferred, in a specified mode and type. The data transferred may be a part of a file, an entire file or a number of files. The path may be between a server-DTP and a user-DTP, or between two server-DTPs. data port - The passive data transfer process "listens" on the data port for a connection from the active transfer process in order to open the data connection. DTP - The data transfer process establishes and manages the data connection. The DTP can be passive or active. End-of-Line - The end-of-line sequence defines the separation of printing lines. 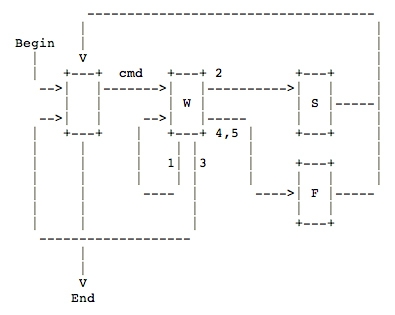 The sequence is Carriage Return, followed by Line Feed. EOF - The end-of-file condition that defines the end of a file being transferred. EOR - The end-of-record condition that defines the end of a record being transferred. error recovery - A procedure that allows a user to recover from certain errors such as failure of either host system or transfer process. In FTP, error recovery may involve restarting a file transfer at a given checkpoint. FTP commands - A set of commands that comprise the control information flowing from the user-FTP to the server-FTP process. file - An ordered set of computer data (including programs), of arbitrary length, uniquely identified by a pathname. mode - The mode in which data is to be transferred via the data connection. The mode defines the data format during transfer including EOR and EOF. The transfer modes defined in FTP are described in the Section on Transmission Modes. 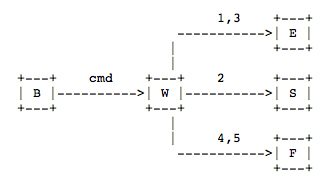 NVT - The Network Virtual Terminal as defined in the Telnet Protocol. NVFS - The Network Virtual File System. A concept which defines a standard network file system with standard commands and pathname conventions. page - A file may be structured as a set of independent parts called pages. FTP supports the transmission of discontinuous files as independent indexed pages. pathname - Pathname is defined to be the character string which must be input to a file system by a user in order to identify a file. Pathname normally contains device and/or directory names, and file name specification. FTP does not yet specify a standard pathname convention. Each user must follow the file naming conventions of the file systems involved in the transfer. PI - The protocol interpreter. The user and server sides of the protocol have distinct roles implemented in a user-PI and a server-PI. record - A sequential file may be structured as a number of contiguous parts called records. Record structures are supported by FTP but a file need not have record structure. reply - A reply is an acknowledgment (positive or negative) sent from server to user via the control connection in response to FTP commands. The general form of a reply is a completion code (including error codes) followed by a text string. The codes are for use by programs and the text is usually intended for human users. server-DTP - The data transfer process, in its normal "active" state, establishes the data connection with the "listening" data port. It sets up parameters for transfer and storage, and transfers data on command from its PI. The DTP can be placed in a "passive" state to listen for, rather than initiate a connection on the data port. server-FTP process - A process or set of processes which perform the function of file transfer in cooperation with a user-FTP process and, possibly, another server. The functions consist of a protocol interpreter (PI) and a data transfer process (DTP). server-PI - The server protocol interpreter "listens" on Port L for a connection from a user-PI and establishes a control communication connection. It receives standard FTP commands from the user-PI, sends replies, and governs the server-DTP. type - The data representation type used for data transfer and storage. Type implies certain transformations between the time of data storage and data transfer. The representation types defined in FTP are described in the Section on Establishing Data Connections. user - A person or a process on behalf of a person wishing to obtain file transfer service. 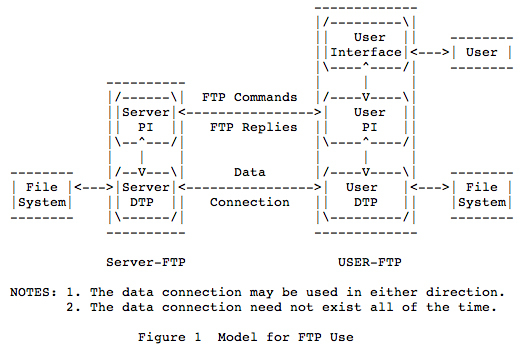 The human user may interact directly with a server-FTP process, but use of a user-FTP process is preferred since the protocol design is weighted towards automata. user-DTP - The data transfer process "listens" on the data port for a connection from a server-FTP process. If two servers are transferring data between them, the user-DTP is inactive. user-FTP process - A set of functions including a protocol interpreter, a data transfer process and a user interface which together perform the function of file transfer in cooperation with one or more server-FTP processes. The user interface allows a local language to be used in the command-reply dialogue with the user. user-PI - The user protocol interpreter initiates the control connection from its port U to the server-FTP process, initiates FTP commands, and governs the user-DTP if that process is part of the file transfer. In the model described in Figure 1, the user-protocol interpreter initiates the control connection. The control connection follows the Telnet protocol. At the initiation of the user, standard FTP commands are generated by the user-PI and transmitted to the server process via the control connection. (The user may establish a direct control connection to the server-FTP, from a TAC terminal for example, and generate standard FTP commands independently, bypassing the user-FTP process.) Standard replies are sent from the server-PI to the user-PI over the control connection in response to the commands. The FTP commands specify the parameters for the data connection (data port, transfer mode, representation type, and structure) and the nature of file system operation (store, retrieve, append, delete, etc.). The user-DTP or its designate should "listen" on the specified data port, and the server initiate the data connection and data transfer in accordance with the specified parameters. It should be noted that the data port need not be in the same host that initiates the FTP commands via the control connection, but the user or the user-FTP process must ensure a "listen" on the specified data port. It ought to also be noted that the data connection may be used for simultaneous sending and receiving. In another situation a user might wish to transfer files between two hosts, neither of which is a local host. The user sets up control connections to the two servers and then arranges for a data connection between them. In this manner, control information is passed to the user-PI but data is transferred between the server data transfer processes. Following is a model of this server-server interaction. The protocol requires that the control connections be open while data transfer is in progress. It is the responsibility of the user to request the closing of the control connections when finished using the FTP service, while it is the server who takes the action. The server may abort data transfer if the control connections are closed without command. The FTP uses the Telnet protocol on the control connection. This can be achieved in two ways: first, the user-PI or the server-PI may implement the rules of the Telnet Protocol directly in their own procedures; or, second, the user-PI or the server-PI may make use of the existing Telnet module in the system. Ease of implementaion, sharing code, and modular programming argue for the second approach. Efficiency and independence argue for the first approach. In practice, FTP relies on very little of the Telnet Protocol, so the first approach does not necessarily involve a large amount of code. Files are transferred only via the data connection. The control connection is used for the transfer of commands, which describe the functions to be performed, and the replies to these commands (see the Section on FTP Replies). Several commands are concerned with the transfer of data between hosts. These data transfer commands include the MODE command which specify how the bits of the data are to be transmitted, and the STRUcture and TYPE commands, which are used to define the way in which the data are to be represented. The transmission and representation are basically independent but the "Stream" transmission mode is dependent on the file structure attribute and if "Compressed" transmission mode is used, the nature of the filler byte depends on the representation type. Data is transferred from a storage device in the sending host to a storage device in the receiving host. Often it is necessary to perform certain transformations on the data because data storage representations in the two systems are different. For example, NVT-ASCII has different data storage representations in different systems. DEC TOPS-20s's generally store NVT-ASCII as five 7-bit ASCII characters, left-justified in a 36-bit word. 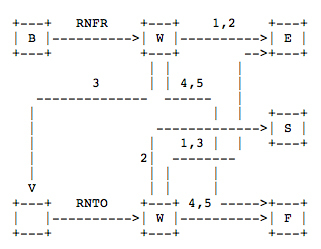 IBM Mainframe's store NVT-ASCII as 8-bit EBCDIC codes. 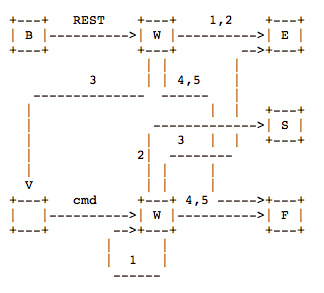 Multics stores NVT-ASCII as four 9-bit characters in a 36-bit word. It is desirable to convert characters into the standard NVT-ASCII representation when transmitting text between dissimilar systems. The sending and receiving sites would have to perform the necessary transformations between the standard representation and their internal representations. A different problem in representation arises when transmitting binary data (not character codes) between host systems with different word lengths. It is not always clear how the sender should send data, and the receiver store it. For example, when transmitting 32-bit bytes from a 32-bit word-length system to a 36-bit word-length system, it may be desirable (for reasons of efficiency and usefulness) to store the 32-bit bytes right-justified in a 36-bit word in the latter system. In any case, the user should have the option of specifying data representation and transformation functions. It should be noted that FTP provides for very limited data type representations. Transformations desired beyond this limited capability should be performed by the user directly. Data representations are handled in FTP by a user specifying a representation type. This type may implicitly (as in ASCII or EBCDIC) or explicitly (as in Local byte) define a byte size for interpretation which is referred to as the "logical byte size." Note that this has nothing to do with the byte size used for transmission over the data connection, called the "transfer byte size", and the two should not be confused. 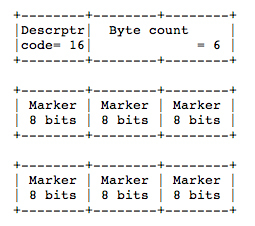 For example, NVT-ASCII has a logical byte size of 8 bits. If the type is Local byte, then the TYPE command has an obligatory second parameter specifying the logical byte size. The transfer byte size is always 8 bits. 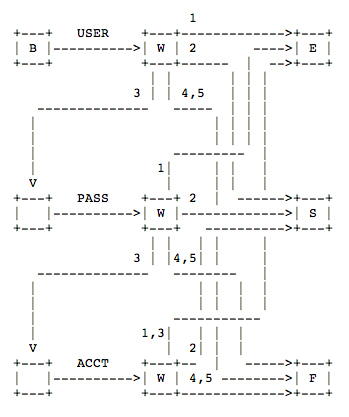 The sender converts the data from an internal character representation to the standard 8-bit NVT-ASCII representation (see the Telnet specification). The receiver will convert the data from the standard form to his own internal form. This type is intended for efficient transfer between hosts which use EBCDIC for their internal character representation. For transmission, the data are represented as 8-bit EBCDIC characters. The character code is the only difference between the functional specifications of EBCDIC and ASCII types. The data is transferred in logical bytes of the size specified by the obligatory second parameter, Byte size. The value of Byte size must be a decimal integer; there is no default value. The logical byte size is not necessarily the same as the transfer byte size. If there is a difference in byte sizes, then the logical bytes should be packed contiguously, disregarding transfer byte boundaries and with any necessary padding at the end. When the data reaches the receiving host, it will be transformed in a manner dependent on the logical byte size and the particular host. This transformation must be invertible (i.e., an identical file can be retrieved if the same parameters are used) and should be well publicized by the FTP implementors. For example, a user sending 36-bit floating-point numbers to a host with a 32-bit word could send that data as Local byte with a logical byte size of 36. The receiving host would then be expected to store the logical bytes so that they could be easily manipulated; in this example putting the 36-bit logical bytes into 64-bit double words should suffice. In another example, a pair of hosts with a 36-bit word size may send data to one another in words by using TYPE L 36. The data would be sent in the 8-bit transmission bytes packed so that 9 transmission bytes carried two host words. This is the default format to be used if the second (format) parameter is omitted. Non-print format must be accepted by all FTP implementations. The file need contain no vertical format information. If it is passed to a printer process, this process may assume standard values for spacing and margins. The file contains ASA (FORTRAN) vertical format control characters. (See RFC 740 Appendix C; and Communications of the ACM, Vol. 7, No. 10, p. 606, October 1964.) In a line or a record formatted according to the ASA Standard, the first character is not to be printed. Instead, it should be used to determine the vertical movement of the paper which should take place before the rest of the record is printed. File-structure is the default to be assumed if the STRUcture command has not been used but both file and record structures must be accepted for "text" files (i.e., files with TYPE ASCII or EBCDIC) by all FTP implementations. The structure of a file will affect both the transfer mode of a file (see the Section on Transmission Modes) and the interpretation and storage of the file. The "natural" structure of a file will depend on which host stores the file. A source-code file will usually be stored on an IBM Mainframe in fixed length records but on a DEC TOPS-20 as a stream of characters partitioned into lines, for example by <CRLF>. If the transfer of files between such disparate sites is to be useful, there must be some way for one site to recognize the other's assumptions about the file. With some sites being naturally file-oriented and others naturally record-oriented there may be problems if a file with one structure is sent to a host oriented to the other. If a text file is sent with record-structure to a host which is file oriented, then that host should apply an internal transformation to the file based on the record structure. Obviously, this transformation should be useful, but it must also be invertible so that an identical file may be retrieved using record structure. In the case of a file being sent with file-structure to a record-oriented host, there exists the question of what criteria the host should use to divide the file into records which can be processed locally. If this division is necessary, the FTP implementation should use the end-of-line sequence, <CRLF> for ASCII, or <NL> for EBCDIC text files, as the delimiter. If an FTP implementation adopts this technique, it must be prepared to reverse the transformation if the file is retrieved with file-structure. File structure is the default to be assumed if the STRUcture command has not been used. In file-structure there is no internal structure and the file is considered to be a continuous sequence of data bytes. Record structures must be accepted for "text" files (i.e., files with TYPE ASCII or EBCDIC) by all FTP implementations. In record-structure the file is made up of sequential records. To transmit files that are discontinuous, FTP defines a page structure. Files of this type are sometimes known as "random access files" or even as "holey files". In these files there is sometimes other information associated with the file as a whole (e.g., a file descriptor), or with a section of the file (e.g., page access controls), or both. In FTP, the sections of the file are called pages. Header Length - The number of logical bytes in the page header including this byte. The minimum header length is 4. Page Index - The logical page number of this section of the file. This is not the transmission sequence number of this page, but the index used to identify this page of the file. Data Length - The number of logical bytes in the page data. The minimum data length is 0. 0 = Last Page - This is used to indicate the end of a paged structured transmission. The header length must be 4, and the data length must be 0. 1 = Simple Page - This is the normal type for simple paged files with no page level associated control information. The header length must be 4. 2 = Descriptor Page - This type is used to transmit the descriptive information for the file as a whole. 3 = Access Controlled Page - This type includes an additional header field for paged files with page level access control information. The header length must be 5. Optional Fields - Further header fields may be used to supply per page control information, for example, per page access control. All fields are one logical byte in length. The logical byte size is specified by the TYPE command. See Appendix I for further details and a specific case at the page structure. The mechanics of transferring data consists of setting up the data connection to the appropriate ports and choosing the parameters for transfer. Both the user and the server-DTPs have a default data port. The user-process default data port is the same as the control connection port (i.e., U). The server-process default data port is the port adjacent to the control connection port (i.e., L-1). Every FTP implementation must support the use of the default data ports, and only the USER-PI can initiate a change to non-default ports. It is possible for the user to specify an alternate data port by use of the PORT command. The user may want a file dumped on a TAC line printer or retrieved from a third party host. In the latter case, the user-PI sets up control connections with both server-PI's. One server is then told (by an FTP command) to "listen" for a connection which the other will initiate. The user-PI sends one server-PI a PORT command indicating the data port of the other. Finally, both are sent the appropriate transfer commands. The exact sequence of commands and replies sent between the user-controller and the servers is defined in the Section on FTP Replies. The server has completed sending data in a transfer mode that requires a close to indicate EOF. The server receives an ABORT command from the user. The port specification is changed by a command from the user. The control connection is closed legally or otherwise. An irrecoverable error condition occurs. Otherwise the close is a server option, the exercise of which the server must indicate to the user-process by either a 250 or 226 reply only. Default Data Connection Ports: All FTP implementations must support use of the default data connection ports, and only the User-PI may initiate the use of non-default ports. Negotiating Non-Default Data Ports: The User-PI may specify a non-default user side data port with the PORT command. The User-PI may request the server side to identify a non-default server side data port with the PASV command. Since a connection is defined by the pair of addresses, either of these actions is enough to get a different data connection, still it is permitted to do both commands to use new ports on both ends of the data connection. Reuse of the Data Connection: When using the stream mode of data transfer the end of the file must be indicated by closing the connection. This causes a problem if multiple files are to be transfered in the session, due to need for TCP to hold the connection record for a time out period to guarantee the reliable communication. Thus the connection can not be reopened at once. There are two solutions to this problem. The first is to negotiate a non-default port. The second is to use another transfer mode. A comment on transfer modes. The stream transfer mode is inherently unreliable, since one can not determine if the connection closed prematurely or not. The other transfer modes (Block, Compressed) do not close the connection to indicate the end of file. They have enough FTP encoding that the data connection can be parsed to determine the end of the file. Thus using these modes one can leave the data connection open for multiple file transfers. The next consideration in transferring data is choosing the appropriate transmission mode. There are three modes: one which formats the data and allows for restart procedures; one which also compresses the data for efficient transfer; and one which passes the data with little or no processing. In this last case the mode interacts with the structure attribute to determine the type of processing. In the compressed mode, the representation type determines the filler byte. For the purpose of standardized transfer, the sending host will translate its internal end of line or end of record denotation into the representation prescribed by the transfer mode and file structure, and the receiving host will perform the inverse translation to its internal denotation. An IBM Mainframe record count field may not be recognized at another host, so the end-of-record information may be transferred as a two byte control code in Stream mode or as a flagged bit in a Block or Compressed mode descriptor. End-of-line in an ASCII or EBCDIC file with no record structure should be indicated by <CRLF> or <NL>, respectively. Since these transformations imply extra work for some systems, identical systems transferring non-record structured text files might wish to use a binary representation and stream mode for the transfer. In a record structured file EOR and EOF will each be indicated by a two-byte control code. The first byte of the control code will be all ones, the escape character. The second byte will have the low order bit on and zeros elsewhere for EOR and the second low order bit on for EOF; that is, the byte will have value 1 for EOR and value 2 for EOF. EOR and EOF may be indicated together on the last byte transmitted by turning both low order bits on (i.e., the value 3). If a byte of all ones was intended to be sent as data, it should be repeated in the second byte of the control code. If the structure is a file structure, the EOF is indicated by the sending host closing the data connection and all bytes are data bytes. The file is transmitted as a series of data blocks preceded by one or more header bytes. The header bytes contain a count field, and descriptor code. The count field indicates the total length of the data block in bytes, thus marking the beginning of the next data block (there are no filler bits). The descriptor code defines: last block in the file (EOF) last block in the record (EOR), restart marker (see the Section on Error Recovery and Restart) or suspect data (i.e., the data being transferred is suspected of errors and is not reliable). This last code is NOT intended for error control within FTP. It is motivated by the desire of sites exchanging certain types of data (e.g., seismic or weather data) to send and receive all the data despite local errors (such as "magnetic tape read errors"), but to indicate in the transmission that certain portions are suspect). Record structures are allowed in this mode, and any representation type may be used. With this encoding, more than one descriptor coded condition may exist for a particular block. As many bits as necessary may be flagged. The restart marker is embedded in the data stream as an integral number of 8-bit bytes representing printable characters in the language being used over the control connection (e.g., default--NVT-ASCII). <SP> (Space, in the appropriate language) must not be used WITHIN a restart marker. String of n data bytes d(1),..., d(n) Count n must be positive. A string of n filler bytes can be compressed into a single byte, where the filler byte varies with the representation type. If the type is ASCII or EBCDIC the filler byte is <SP> (Space, ASCII code 32, EBCDIC code 64). If the type is Image or Local byte the filler is a zero byte. The restart procedure is defined only for the block and compressed modes of data transfer. It requires the sender of data to insert a special marker code in the data stream with some marker information. The marker information has meaning only to the sender, but must consist of printable characters in the default or negotiated language of the control connection (ASCII or EBCDIC). The marker could represent a bit-count, a record-count, or any other information by which a system may identify a data checkpoint. The receiver of data, if it implements the restart procedure, would then mark the corresponding position of this marker in the receiving system, and return this information to the user. The sender of the data inserts an appropriate marker block in the data stream at a convenient point. The receiving host marks the corresponding data point in its file system and conveys the last known sender and receiver marker information to the user, either directly or over the control connection in a 110 reply (depending on who is the sender). In the event of a system failure, the user or controller process restarts the server at the last server marker by sending a restart command with server's marker code as its argument. The restart command is transmitted over the control connection and is immediately followed by the command (such as RETR, STOR or LIST) which was being executed when the system failure occurred. The communication channel from the user-PI to the server-PI is established as a TCP connection from the user to the standard server port. The user protocol interpreter is responsible for sending FTP commands and interpreting the replies received; the server-PI interprets commands, sends replies and directs its DTP to set up the data connection and transfer the data. If the second party to the data transfer (the passive transfer process) is the user-DTP, then it is governed through the internal protocol of the user-FTP host; if it is a second server-DTP, then it is governed by its PI on command from the user-PI. The FTP replies are discussed in the next section. In the description of a few of the commands in this section, it is helpful to be explicit about the possible replies. USER NAME (USER) - The argument field is a Telnet string identifying the user. The user identification is that which is required by the server for access to its file system. This command will normally be the first command transmitted by the user after the control connections are made (some servers may require this). Additional identification information in the form of a password and/or an account command may also be required by some servers. Servers may allow a new USER command to be entered at any point in order to change the access control and/or accounting information. This has the effect of flushing any user, password, and account information already supplied and beginning the login sequence again. All transfer parameters are unchanged and any file transfer in progress is completed under the old access control parameters. PASSWORD (PASS) - The argument field is a Telnet string specifying the user's password. This command must be immediately preceded by the user name command, and, for some sites, completes the user's identification for access control. Since password information is quite sensitive, it is desirable in general to "mask" it or suppress typeout. It appears that the server has no foolproof way to achieve this. It is therefore the responsibility of the user-FTP process to hide the sensitive password information. ACCOUNT (ACCT) - The argument field is a Telnet string identifying the user's account. The command is not necessarily related to the USER command, as some sites may require an account for login and others only for specific access, such as storing files. In the latter case the command may arrive at any time. There are reply codes to differentiate these cases for the automation: when account information is required for login, the response to a successful PASSword command is reply code 332. On the other hand, if account information is NOT required for login, the reply to a successful PASSword command is 230; and if the account information is needed for a command issued later in the dialogue, the server should return a 332 or 532 reply depending on whether it stores (pending receipt of the ACCounT command) or discards the command, respectively. CHANGE WORKING DIRECTORY (CWD) - This command allows the user to work with a different directory or dataset for file storage or retrieval without altering his login or accounting information. Transfer parameters are similarly unchanged. The argument is a pathname specifying a directory or other system dependent file group designator. CHANGE TO PARENT DIRECTORY (CDUP) - This command is a special case of CWD, and is included to simplify the implementation of programs for transferring directory trees between operating systems having different syntaxes for naming the parent directory. The reply codes shall be identical to the reply codes of CWD. See Appendix II for further details. STRUCTURE MOUNT (SMNT) - This command allows the user to mount a different file system data structure without altering his login or accounting information. Transfer parameters are similarly unchanged. The argument is a pathname specifying a directory or other system dependent file group designator. REINITIALIZE (REIN) - This command terminates a USER, flushing all I/O and account information, except to allow any transfer in progress to be completed. All parameters are reset to the default settings and the control connection is left open. This is identical to the state in which a user finds himself immediately after the control connection is opened. A USER command may be expected to follow. LOGOUT (QUIT) - This command terminates a USER and if file transfer is not in progress, the server closes the control connection. If file transfer is in progress, the connection will remain open for result response and the server will then close it. If the user-process is transferring files for several USERs but does not wish to close and then reopen connections for each, then the REIN command should be used instead of QUIT. An unexpected close on the control connection will cause the server to take the effective action of an abort (ABOR) and a logout (QUIT). DATA PORT (PORT) - The argument is a HOST-PORT specification for the data port to be used in data connection. There are defaults for both the user and server data ports, and under normal circumstances this command and its reply are not needed. If this command is used, the argument is the concatenation of a 32-bit internet host address and a 16-bit TCP port address. This address information is broken into 8-bit fields and the value of each field is transmitted as a decimal number (in character string representation). The fields are separated by commas. A port command would be: PORT h1,h2,h3,h4,p1,p2 where h1 is the high order 8 bits of the internet host address. PASSIVE (PASV) - This command requests the server-DTP to "listen" on a data port (which is not its default data port) and to wait for a connection rather than initiate one upon receipt of a transfer command. The response to this command includes the host and port address this server is listening on. RETRIEVE (RETR) - This command causes the server-DTP to transfer a copy of the file, specified in the pathname, to the server- or user-DTP at the other end of the data connection. The status and contents of the file at the server site shall be unaffected. STORE (STOR) - This command causes the server-DTP to accept the data transferred via the data connection and to store the data as a file at the server site. If the file specified in the pathname exists at the server site, then its contents shall be replaced by the data being transferred. A new file is created at the server site if the file specified in the pathname does not already exist. STORE UNIQUE (STOU) - This command behaves like STOR except that the resultant file is to be created in the current directory under a name unique to that directory. The 250 Transfer Started response must include the name generated. APPEND (with create) (APPE) - This command causes the server-DTP to accept the data transferred via the data connection and to store the data in a file at the server site. If the file specified in the pathname exists at the server site, then the data shall be appended to that file; otherwise the file specified in the pathname shall be created at the server site. ALLOCATE (ALLO) - This command may be required by some servers to reserve sufficient storage to accommodate the new file to be transferred. The argument shall be a decimal integer representing the number of bytes (using the logical byte size) of storage to be reserved for the file. For files sent with record or page structure a maximum record or page size (in logical bytes) might also be necessary; this is indicated by a decimal integer in a second argument field of the command. This second argument is optional, but when present should be separated from the first by the three Telnet characters <SP> R <SP>. This command shall be followed by a STORe or APPEnd command. The ALLO command should be treated as a NOOP (no operation) by those servers which do not require that the maximum size of the file be declared beforehand, and those servers interested in only the maximum record or page size should accept a dummy value in the first argument and ignore it. RESTART (REST) - The argument field represents the server marker at which file transfer is to be restarted. This command does not cause file transfer but skips over the file to the specified data checkpoint. This command shall be immediately followed by the appropriate FTP service command which shall cause file transfer to resume. RENAME FROM (RNFR) - This command specifies the old pathname of the file which is to be renamed. This command must be immediately followed by a "rename to" command specifying the new file pathname. RENAME TO (RNTO) - This command specifies the new pathname of the file specified in the immediately preceding "rename from" command. Together the two commands cause a file to be renamed. ABORT (ABOR) - This command tells the server to abort the previous FTP service command and any associated transfer of data. The abort command may require "special action", as discussed in the Section on FTP Commands, to force recognition by the server. No action is to be taken if the previous command has been completed (including data transfer). The control connection is not to be closed by the server, but the data connection must be closed. There are two cases for the server upon receipt of this command: (1) the FTP service command was already completed, or (2) the FTP service command is still in progress. In the first case, the server closes the data connection (if it is open) and responds with a 226 reply, indicating that the abort command was successfully processed. In the second case, the server aborts the FTP service in progress and closes the data connection, returning a 426 reply to indicate that the service request terminated abnormally. The server then sends a 226 reply, indicating that the abort command was successfully processed. DELETE (DELE) - This command causes the file specified in the pathname to be deleted at the server site. If an extra level of protection is desired (such as the query, "Do you really wish to delete? "), it should be provided by the user-FTP process. REMOVE DIRECTORY (RMD) - This command causes the directory specified in the pathname to be removed as a directory (if the pathname is absolute) or as a subdirectory of the current working directory (if the pathname is relative). See Appendix II. MAKE DIRECTORY (MKD) - This command causes the directory specified in the pathname to be created as a directory (if the pathname is absolute) or as a subdirectory of the current working directory (if the pathname is relative). See Appendix II. PRINT WORKING DIRECTORY (PWD) - This command causes the name of the current working directory to be returned in the reply. See Appendix II. LIST (LIST) - This command causes a list to be sent from the server to the passive DTP. If the pathname specifies a directory or other group of files, the server should transfer a list of files in the specified directory. If the pathname specifies a file then the server should send current information on the file. A null argument implies the user's current working or default directory. The data transfer is over the data connection in type ASCII or type EBCDIC. (The user must ensure that the TYPE is appropriately ASCII or EBCDIC). Since the information on a file may vary widely from system to system, this information may be hard to use automatically in a program, but may be quite useful to a human user. NAME LIST (NLST) - This command causes a directory listing to be sent from server to user site. The pathname should specify a directory or other system-specific file group descriptor; a null argument implies the current directory. The server will return a stream of names of files and no other information. The data will be transferred in ASCII or EBCDIC type over the data connection as valid pathname strings separated by <CRLF> or <NL>. (Again the user must ensure that the TYPE is correct.) This command is intended to return information that can be used by a program to further process the files automatically. For example, in the implementation of a "multiple get" function. SITE PARAMETERS (SITE) - This command is used by the server to provide services specific to his system that are essential to file transfer but not sufficiently universal to be included as commands in the protocol. The nature of these services and the specification of their syntax can be stated in a reply to the HELP SITE command. SYSTEM (SYST) - This command is used to find out the type of operating system at the server. The reply shall have as its first word one of the system names listed in the current version of the Assigned Numbers document. STATUS (STAT) - This command shall cause a status response to be sent over the control connection in the form of a reply. The command may be sent during a file transfer (along with the Telnet IP and Synch signals--see the Section on FTP Commands) in which case the server will respond with the status of the operation in progress, or it may be sent between file transfers. In the latter case, the command may have an argument field. If the argument is a pathname, the command is analogous to the "list" command except that data shall be transferred over the control connection. If a partial pathname is given, the server may respond with a list of file names or attributes associated with that specification. If no argument is given, the server should return general status information about the server FTP process. This should include current values of all transfer parameters and the status of connections. HELP (HELP) - This command shall cause the server to send helpful information regarding its implementation status over the control connection to the user. The command may take an argument (e.g., any command name) and return more specific information as a response. The reply is type 211 or 214. It is suggested that HELP be allowed before entering a USER command. The server may use this reply to specify site-dependent parameters, e.g., in response to HELP SITE. NOOP (NOOP) - This command does not affect any parameters or previously entered commands. It specifies no action other than that the server send an OK reply. The File Transfer Protocol follows the specifications of the Telnet protocol for all communications over the control connection. Since the language used for Telnet communication may be a negotiated option, all references in the next two sections will be to the "Telnet language" and the corresponding "Telnet end-of-line code". Currently, one may take these to mean NVT-ASCII and <CRLF>. No other specifications of the Telnet protocol will be cited. User system inserts the Telnet "Interrupt Process" (IP) signal in the Telnet stream. User system sends the Telnet "Synch" signal. User system inserts the command (e.g., ABOR) in the Telnet stream. Server PI, after receiving "IP", scans the Telnet stream for EXACTLY ONE FTP command. A reply is defined to contain the 3-digit code, followed by Space <SP>, followed by one line of text (where some maximum line length has been specified), and terminated by the Telnet end-of-line code. There will be cases however, where the text is longer than a single line. In these cases the complete text must be bracketed so the User-process knows when it may stop reading the reply (i.e. stop processing input on the control connection) and go do other things. This requires a special format on the first line to indicate that more than one line is coming, and another on the last line to designate it as the last. At least one of these must contain the appropriate reply code to indicate the state of the transaction. To satisfy all factions, it was decided that both the first and last line codes should be the same. This scheme allows standard system routines to be used for reply information (such as for the STAT reply), with "artificial" first and last lines tacked on. In rare cases where these routines are able to generate three digits and a Space at the beginning of any line, the beginning of each text line should be offset by some neutral text, like Space. The three digits of the reply each have a special significance. This is intended to allow a range of very simple to very sophisticated responses by the user-process. The first digit denotes whether the response is good, bad or incomplete. (Referring to the state diagram), an unsophisticated user-process will be able to determine its next action (proceed as planned, redo, retrench, etc.) by simply examining this first digit. A user-process that wants to know approximately what kind of error occurred (e.g. file system error, command syntax error) may examine the second digit, reserving the third digit for the finest gradation of information (e.g., RNTO command without a preceding RNFR). 1yz Positive Preliminary reply - The requested action is being initiated; expect another reply before proceeding with a new command. (The user-process sending another command before the completion reply would be in violation of protocol; but server-FTP processes should queue any commands that arrive while a preceding command is in progress.) This type of reply can be used to indicate that the command was accepted and the user-process may now pay attention to the data connections, for implementations where simultaneous monitoring is difficult. The server-FTP process may send at most, one 1yz reply per command. 2yz Positive Completion reply - The requested action has been successfully completed. A new request may be initiated. 3yz Positive Intermediate reply - The command has been accepted, but the requested action is being held in abeyance, pending receipt of further information. The user should send another command specifying this information. This reply is used in command sequence groups. x0z Syntax - These replies refer to syntax errors, syntactically correct commands that don't fit any functional category, unimplemented or superfluous commands. x1z Information - These are replies to requests for information, such as status or help. x2z Connections - Replies referring to the control and data connections. x3z Authentication and accounting - Replies for the login process and accounting procedures. x5z File system - These replies indicate the status of the Server file system vis-a-vis the requested transfer or other file system action. COMMANDS - USER, QUIT, PORT, TYPE, MODE, STRU, for the default values RETR, STOR, NOOP. The server protocol interpreter shall "listen" on Port L. The user or user protocol interpreter shall initiate the full-duplex control connection. Server- and user- processes should follow the conventions of the Telnet protocol as specified in the ARPA-Internet Protocol Handbook . Servers are under no obligation to provide for editing of command lines and may require that it be done in the user host. The control connection shall be closed by the server at the user's request after all transfers and replies are completed. Note that all FTP implementation must support data transfer using the default port, and that only the USER-PI may initiate the use of non-default ports. The data connection shall be closed by the server under the conditions described in the Section on Establishing Data Connections. If the data connection is to be closed following a data transfer where closing the connection is not required to indicate the end-of-file, the server must do so immediately. Waiting until after a new transfer command is not permitted because the user-process will have already tested the data connection to see if it needs to do a "listen"; (remember that the user must "listen" on a closed data port BEFORE sending the transfer request). To prevent a race condition here, the server sends a reply (226) after closing the data connection (or if the connection is left open, a "file transfer completed" reply (250) and the user-PI should wait for one of these replies before issuing a new transfer command). Any time either the user or server see that the connection is being closed by the other side, it should promptly read any remaining data queued on the connection and issue the close on its own side. The commands are Telnet character strings transmitted over the control connections as described in the Section on FTP Commands. The command functions and semantics are described in the Section on Access Control Commands, Transfer Parameter Commands, FTP Service Commands, and Miscellaneous Commands. The command syntax is specified here. The argument field consists of a variable length character string ending with the character sequence <CRLF> (Carriage Return, Line Feed) for NVT-ASCII representation; for other negotiated languages a different end of line character might be used. It should be noted that the server is to take no action until the end of line code is received. One important group of informational replies is the connection greetings. Under normal circumstances, a server will send a 220 reply, "awaiting input", when the connection is completed. The user should wait for this greeting message before sending any commands. If the server is unable to accept input right away, a 120 "expected delay" reply should be sent immediately and a 220 reply when ready. The user will then know not to hang up if there is a delay. Sometimes "the system" spontaneously has a message to be sent to a user (usually all users). For example, "System going down in 15 minutes". There is no provision in FTP for such spontaneous information to be sent from the server to the user. It is recommended that such information be queued in the server-PI and delivered to the user-PI in the next reply (possibly making it a multi-line reply). ABOR, ALLO, DELE, CWD, CDUP, SMNT, HELP, MODE, NOOP, PASV, QUIT, SITE, PORT, SYST, STAT, RMD, MKD, PWD, STRU, and TYPE. Note that this second model could also be used to represent the first group of commands, the only difference being that in the first group the 100 series replies are unexpected and therefore treated as error, while the second group expects (some may require) 100 series replies. Remember that at most, one 100 series reply is allowed per command. We note that the above three models are similar. The Restart differs from the Rename two only in the treatment of 100 series replies at the second stage, while the second group expects (some may require) 100 series replies. Remember that at most, one 100 series reply is allowed per command. In general, the user will communicate to the server via a mediating user-FTP process. The following may be a typical scenario. The user-FTP prompts are shown in parentheses, '---->' represents commands from host U to host S, and '<----' represents replies from host S to host U. (for. pathname) test.pl1<CR> User-FTP opens local file in ASCII. (for.pathname) >udd>cn>fd<CR> User-FTP opens local file in Image. The need for FTP to support page structure derives principally from the need to support efficient transmission of files between TOPS-20 systems, particularly the files used by NLS. The file system of TOPS-20 is based on the concept of pages. The operating system is most efficient at manipulating files as pages. The operating system provides an interface to the file system so that many applications view files as sequential streams of characters. However, a few applications use the underlying page structures directly, and some of these create holey files. A TOPS-20 disk file consists of four things: a pathname, a page table, a (possibly empty) set of pages, and a set of attributes. The pathname is specified in the RETR or STOR command. It includes the directory name, file name, file name extension, and generation number. The attributes of the file, in the File Descriptor Block (FDB), contain such things as creation time, write time, read time, writer's byte-size, end-of-file pointer, count of reads and writes, backup system tape numbers, etc. Note that there is NO requirement that entries in the page table be contiguous. There may be empty page table slots between occupied ones. Also, the end of file pointer is simply a number. There is no requirement that it in fact point at the "last" datum in the file. Ordinary sequential I/O calls in TOPS-20 will cause the end of file pointer to be left after the last datum written, but other operations may cause it not to be so, if a particular programming system so requires. In fact, in both of these special cases, "holey" files and end-of-file pointers NOT at the end of the file, occur with NLS data files. The TOPS-20 paged files can be sent with the FTP transfer parameters: TYPE L 36, STRU P, and MODE S (in fact, any mode could be used). Each page of information has a header. Each header field, which is a logical byte, is a TOPS-20 word, since the TYPE is L 36. Word 0: Header Length. The header length is 5. Word 1: Page Index. If the data is a disk file page, this is the number of that page in the file's page map. Empty pages (holes) in the file are simply not sent. Note that a hole is NOT the same as a page of zeros. Word 2: Data Length. The number of data words in this page, following the header. Thus, the total length of the transmission unit is the Header Length plus the Data Length. Word 3: Page Type. A code for what type of chunk this is. A data page is type 3, the FDB page is type 2. After the header are Data Length data words. Data Length is currently either 512 for a data page or 31 for an FDB. Trailing zeros in a disk file page may be discarded, making Data Length less than 512 in that case. Since UNIX has a tree-like directory structure in which directories are as easy to manipulate as ordinary files, it is useful to expand the FTP servers on these machines to include commands which deal with the creation of directories. Since there are other hosts on the ARPA-Internet which have tree-like directories (including TOPS-20 and Multics), these commands are as general as possible. MKD pathname - Make a directory with the name "pathname". RMD pathname - Remove the directory with the name "pathname". PWD - Print the current working directory name. CDUP - Change to the parent of the current working directory. The "pathname" argument should be created (removed) as a subdirectory of the current working directory, unless the "pathname" string contains sufficient information to specify otherwise to the server, e.g., "pathname" is an absolute pathname (in UNIX and Multics), or pathname is something like "<abso.lute.path>" to TOPS-20. The CDUP command is a special case of CWD, and is included to simplify the implementation of programs for transferring directory trees between operating systems having different syntaxes for naming the parent directory. The reply codes for CDUP be identical to the reply codes of CWD. The reply codes for RMD be identical to the reply codes for its file analogue, DELE. will fail. The new directory may only be referred to by its "absolute" name; e.g., if the MKD command above were issued while connected to the directory <DFRANKLIN>, the new subdirectory could only be referred to by the name <DFRANKLIN.MYDIR>. Even on UNIX and Multics, however, the argument given to MKD may not be suitable. If it is a "relative" pathname (i.e., a pathname which is interpreted relative to the current directory), the user would need to be in the same current directory in order to reach the subdirectory. Depending on the application, this may be inconvenient. It is not very robust in any case. That is, the server will tell the user what string to use when referring to the created directory. The directory name can contain any character; embedded double-quotes should be escaped by double-quotes (the "quote-doubling" convention). The prior existence of a subdirectory with the same name is an error, and the server must return an "access denied" error reply in that case. The failure replies for MKD are analogous to its file creating cousin, STOR. Also, an "access denied" return is given if a file name with the same name as the subdirectory will conflict with the creation of the subdirectory (this is a problem on UNIX, but shouldn't be one on TOPS-20). Essentially because the PWD command returns the same type of information as the successful MKD command, the successful PWD command uses the 257 reply code as well. Note that the first example results in a subdirectory of the connected directory. In contrast, the argument in the second example contains enough information for TOPS-20 to tell that the <unambiguous> directory is a top-level directory. Note also that in the first example the user "violated" the protocol by attempting to access the freshly created directory with a name other than the one returned by TOPS-20. Problems could have resulted in this case had there been an <overrainbow> directory; this is an ambiguity inherent in some TOPS-20 implementations. Similar considerations apply to the RMD command. The point is this: except where to do so would violate a host's conventions for denoting relative versus absolute pathnames, the host should treat the operands of the MKD and RMD commands as subdirectories. The 257 reply to the MKD command must always contain the absolute pathname of the created directory.